“How can we take advantage of our oneness, being ‘The University of Alaska,’ and at the same time take advantage of the unique strengths of our campuses all across the state?” asked University of Alaska President Jim Johnsen in a video on the university website. His question strikes at the heart of what university system officials hope Strategic Pathways will accomplish. University spokeswoman Roberta Graham called Strategic Pathways a framework. “The university will review its administrative and academic functions to find where there is the possibility of greater alignment, greater efficiency,” said Graham. She said the goal is to improve students’ experience with the university system and to save money. Because of steep budget cuts and a multibillion-dollar state spending gap, Graham said the university’s board of regents asked President Johnsen to find ways to save money and give students a quality education. The university built teams to study how its academic and administrative areas could be improved. The teams started phase one of their work in late June. The teams’ developed options for the board of regents to consider during its latest two-day meeting in Juneau. The board chose the options they liked and now, new teams will consider how to bring those into fruition. For example, the University of Alaska will move to a single college of education with one dean for the entire state — rather than three. 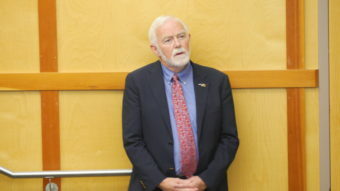 University of Alaska Southeast Chancellor Rick Caulfield hopes the regents choose his school. University officials said the regents adopted Johnsen’s recommendation for UAS to continue offering its bachelor’s of administration and master’s of public administration programs online. Graham said phase two of the Strategic Pathways review will begin in October. Teams will consider a new set of areas to reform. There will be a third phase during the winter, and the entire process is scheduled to end with a final presentation to the board of regents in June 2017. The university also considered reorganizing to hold one accreditation instead of three in Anchorage, Fairbanks and Juneau. She’s unsure how a single accreditation would have changed the university system’s organizational structure. In any case, the board of regents put the option on hold. “I believe the regents felt that it was just a bit too much at this time because it is such a complicated and time-consuming process,” Graham said. The university also released a report that concluded a single accreditation probably wouldn’t save a significant amount of money, improve student experiences or improve academic performance, like some hoped. Graham said the university is placing its bet on Strategic Pathways for now, but a single accreditation is still an option for the future. Next articleHomer Electric wants more control, is that best for consumers?